The Thunder, presented by NJM Insurance, are pleased to announce several additions to the 2019 Promotional schedule. In addition to a special set of bobbleheads and previously announcedpromotions, the 2019 Promotional Schedule features more than 30 total giveaways throughout the 70-game schedule at ARM & HAMMER Park. A must-have giveaway for the summer will take place at the ballpark on Wednesday, May 22 when the Thunder host the Portland Sea Dogs. As part of the team's annual MLB Network Night, the first 1,500 fans, ages 18 and older, will receive an adult Sunglasses Giveaway. Adding to a week of fun at ARM & HAMMER Park, the first 1,000 fans, ages 21 and older, on Thursday, May 30 will receive a Thunder Pint Glass upon entry when the Thunder host the Altoona Curve. The Pint Glass Giveaway, presented by Spellbound Brewing will be a must-have for any kitchen. 2015 Thunder outfielder Aaron Judge will be the subject of a special Youth T-Shirt Giveaway, presented by Kampus Klothes, on Sunday, June 2 when the Thunder host the Harrisburg Senators. This special kids-themed giveaway will send the first 1,000 fans, ages 5-13, home with a one-of-a-kind t-shirt. As part of the previously announced El Trueno de Trenton nights, presented by Aetna, four former Latin-heritage Thunder players will be remembered in a Card Strip Giveaway to the first 1,500 fans, ages six and up, on June 8 when the Thunder host the Erie SeaWolves. 2014-15 Thunder Pitcher Luis Severino, 2017 Thunder infielder Gleyber Torres, 2016-17 Infielder Miguel Andujar and 2013-15 Catcher Gary Sanchez will each be featured with a card in this special COPA-themed giveaway. The Reading Fightin Phils make their first trip to ARM & HAMMER Park Monday, June 24-26 for a series packed with giveaways and can't-miss promotions. Wednesday, June 26 will feature a special Cheer Card Giveaway to the first 1,000 fans, ages 14 and older, presented by NBC Sports Philadelphia. Once the calendar flips to July, your Thunder will celebrate the cool of winter and the heat of summer with a pair of giveaways. Christmas in July will commence on Sunday, July 7 when the Thunder host the Hartford Yard Goats at 1pm and the first 1,000 fans, ages 18 and older, will receive a Snow Globe Giveaway, presented by NJM Insurance. The salute to summer at ARM & HAMMER Park will take place on Sunday, July 21st when the Thunder again host the Yard Goats with a 5pm first pitch. Beach Night at the Park will feature a Beach Ball Giveaway to the first 1,000 fans, ages 5-13, presented by Valley Spas and Pools. July wraps up with Yankees Magazine Night on Wednesday, July 31 when the Thunder host the Altoona Curve at 7pm. The first 1,000 fans, ages six and older, will receive the latest issue of Yankees Magazine as they enter through the gates of the ballpark. 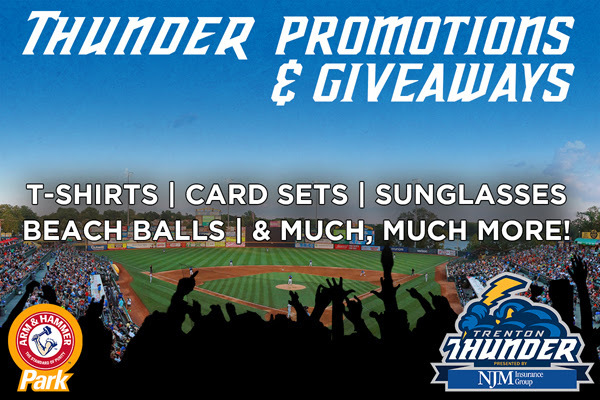 With just 12 games in the month of August at ARM & HAMMER Park, fans won't want to miss several giveaways and promotional nights. One of the most popular theme nights on the year, Hockey Night, will make it's return on Thursday, August 8 when the Thunder host the Bowie Baysox. Hockey Night, presented by NHL Network and the New Jersey Devils, will feature a special prize table with enter-to-win opportunities for signed merchandise from hockey teams all over the continent as well as an appearance from the NJ Devil. The Thunder are pleased to announce the return of several theme nights throughout the summer that will enhance the fan experience: Special Needs Awareness Day on April 14, Ugly Sweater Night on April 15, Medieval Night on April 16, Halfway to Halloween Night on April 27, Ode to Philly Nighton May 10, 90's Night on May 11, Mother's Day on May 12, Ode to New York Night on May 16, SNL Night on May 18, Boomer's Birthday on May 19, Bat Dog Celebration Day on May 21, Girl Scout Night on May 28, The Office Night on May 29, Breast Cancer Awareness Night on June 7, Soccer Night on June 8, Safe Kids Day on June 9, Pride Night on June 10, Friendly K9 Pals Night on June 19 and July 23, HOPE Week June 24-29, Star Wars Night on July 6, Christmas in July on July 7, Irish Heritage Night on July 18, Good Deed Day on July 20, Beach Day on July 21, Harry Potter Night on July 31, 80's Night on August 1, American Revolution Night on August 6, Beach Night on August 10, Football Night on August 19, Business Person's Special on August 21, Augtoberfest on August 31 and Fan Appreciation Day on September 2.